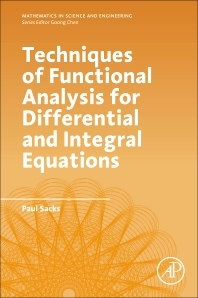 Techniques of Functional Analysis for Differential and Integral Equations describes a variety of powerful and modern tools from mathematical analysis, for graduate study and further research in ordinary differential equations, integral equations and partial differential equations. Knowledge of these techniques is particularly useful as preparation for graduate courses and PhD research in differential equations and numerical analysis, and more specialized topics such as fluid dynamics and control theory. Striking a balance between mathematical depth and accessibility, proofs involving more technical aspects of measure and integration theory are avoided, but clear statements and precise alternative references are given . The work provides many examples and exercises drawn from the literature. Professor Paul Sacks received his B.S. degree from Syracuse University and M.S. and Ph.D. degrees from the University of Wisconsin-Madison, all in Mathematics. Since 1981 he has been in the Mathematics department at Iowa State University, as Full Professor since 1990. He is particularly interested in partial differential equations and inverse problems. He is the author or co-author of more than 60 scientific articles and conference proceedings. For thirty years he has regularly taught courses in analysis, differential equations and methods of applied mathematics for mathematics graduate students.